I build fine furniture that is enhanced with imagery inspired by nature. I build from my own designs, or I make custom pieces designed to fit my client’s needs. I will work with any wood that a client requests, but I generally use domestic woods, especially westcoast natives like claro walnut, western maple, and madrone. Where possible, I prefer to use lumber that is certified as sustainably harvested. I offer a variety of finish options, including low-emissions finishes that may be required by people with chemical sensitivities. I use an inlay technique called marquetry, which is the assembly of thin slices of wood to form an image. 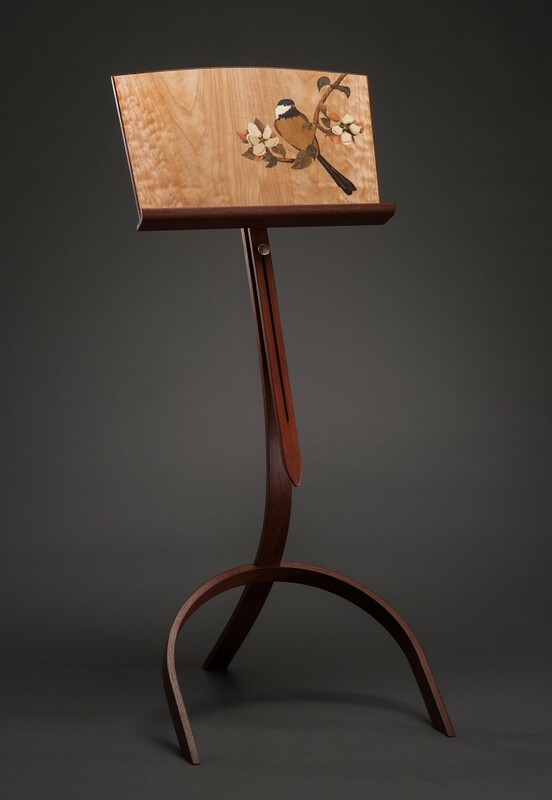 The marquetry work is done using veneers that I resaw myself, using only naturally colored woods. Shading is achieved by dipping inlay pieces in hot sand and scorching them, which adds visual depth. This marquetry technique is ancient, stretching all the way back to Egypt 3,000 years ago, and was developed to great depth during the European Renaissance. But it is detail-oriented, time-consuming, and not widely practiced today. Some mass produced marquetry is done using computers and lasers. My goal is to apply the technique with integrity and artistry, to add beauty to the objects I make without being overstated. My inspiration comes from the natural world, what I think of as the unbuilt world. I have a great appreciation for Japanese design aesthetics, especially the way natural elements are brought into the built world. I also recognize that the forms I work with are rooted in the cultural traditions of Europe. My location on the Pacific Rim provides an opportunity to balance influences from east and west, resulting in a body of New World originals that acknowledge both sources. My goal is to make handcrafted objects that quietly inspire and nurture.